Here are the Rare Disease Day logos for 2012 from the Global Genes Project, the leading rare disease advocacy organization for the rare disease community. Since Rare Disease Day 2012 falls at the end of February each year, the date for 2012 is Feb. 29 (leap year). Wear jeans or demin on Rare Disease Day 2012 — Wear That You Care! 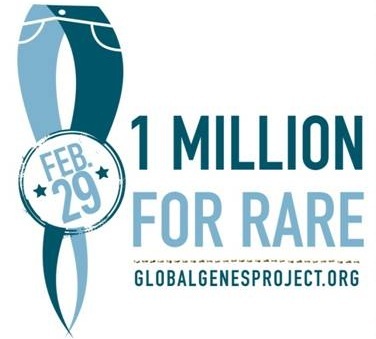 Post pictures of you wearing jeans or denim on the Global Genes Project Facebook page and join the #1MILFORRARE team — let’s unite 1 million people who care about rare so we can have our voices heard! 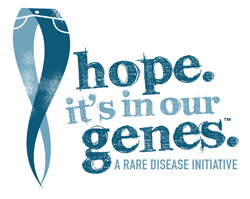 For the official rare disease blue denim ribbon, contact amyg@rareproject.org. What a great idea — a new website to showcase Rare Art created by Rare People to support Rare Disease awareness. The Kakkis Everylife Foundation has launched RareArtist.org for artists of all ages affected by a rare disease. There are almost 7,000 rare diseases that affect more than 25 million Americans — many of them are children like Addi and Cassi who suffer from Niemann Pick Type C disease which causes childhood dementia and is fatal. The EveryLife Art Contest was established to empower artists affected by Rare Diseases to express their unique struggle with a rare disease. An art competition is being held and is open to all artists affected by a Rare Disease ages 5 and older. Check out RareArtist.org today and upload your art! 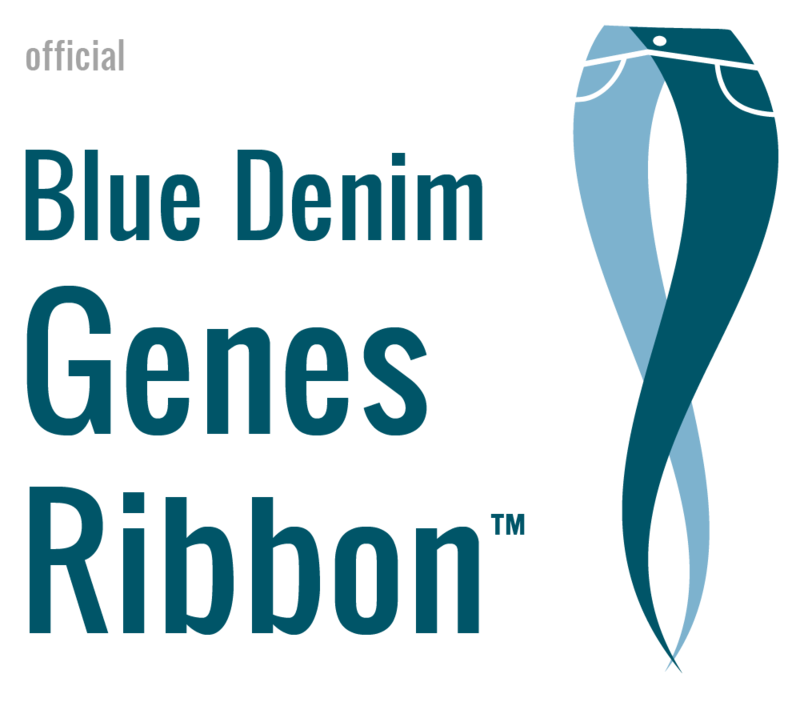 Denim Blue Jeans Ribbon To Symbolize Rare Disease Awareness; New Campaign of Jeans and Genes A Perfect Fit! 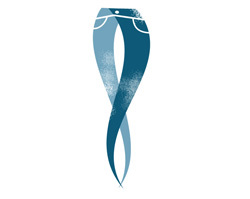 The Rare Disease community now has a powerful and universal new symbol to rally around — a blue jeans denim ribbon created by the Global Genes Project and the Children’s Rare Disease Network. The worldwide initiative lauched today and is focused on raising awareness for millions of children living with rare and debilitating diseases like Addi and Cassi. Just like the pink ribbon symbolizes breast cancer awareness and the red dress created by the American Heart Association symbolizes heart health, the denim jeans ribbon is a perfect fit to symbolize the countless illnesses that involve gene defects like Niemann Pick Type C, Cystic Fibrosis, Prader-Willi, and Fragile X. Numerous Corporations, Non-Profit Foundations, Research Institutions, Hospitals and Advocacy Groups are supporting this new demin campaign for rare disease. Below is the press release announcing the initiative which is just in time for World Rare Disease Day 2010. DANA POINT, CA – February 1, 2010 – Hope – It’s In Our Genes.™ The Children’s Rare Disease Network (http://www.crdnetwork.org) today announced the Global Genes Project (http://www.globalgenesproject.org), an initiative designed to raise awareness about the prevalence of rare diseases that afflict millions of children worldwide. Rare disease advocates organizing the campaign selected a blue jeans denim ribbon as the international symbol of hope for children suffering from life threatening and chronically debilitating rare diseases. More than 90 corporations, non-profit foundations, research institutions and children’s hospitals have signed on to support the Global Genes Project including: 23andme, Amicus Therapeutics, Better Health, BioMarin, CheckOrphan, CollabRx, Counsyl, Coriell Institute, DonateGames.org, FasterCures, FreeForm, Genetic Alliance, Geni.com, Genzyme, Hide and Seek Foundation, Jackson Laboratory, Kakkis EveryLife Foundation, Knome, Lili Claire Foundation, Life Technologies, Mayo Clinic and Shire. Numerous rare disease foundations from countries including Australia, Argentina, Belgium, Canada, China, New Zealand, Philippines, the United Kingdom and United States are helping support the global movement by organizing activities throughout February and leading up to World Rare Disease Day 2010. Rare disease is an important and growing global public health concern that can no longer be ignored. While each disease may be rare when considered by itself, rare disease collectively impacts the lives of millions. According to estimates from the National Institutes of Health (NIH), approximately 6,800 rare diseases exist, many of which are genetic in origin, translating to an affected population of 25-30 million Americans or approximately 1 in 10 people. In Europe, the number affected is almost identical. Approximately 75% of those affected by rare diseases are children, making the rare disease category one of the most deadly and debilitating for children worldwide. Despite the success of the Orphan Drug Act of 1983, pharmacologic treatments exist for only a small fraction of rare diseases, or approximately 200 of the 6,800 rare diseases. After 25 years of orphan drug regulations and legislation, the development path to approve new drugs has not stimulated orphan drug development for small populations of patients facing rare disease. Current studies also suggest that it takes more than a dozen years and hundreds of millions of dollars to take a potential drug from discovery to the marketplace. As a result, severe inequity exists in access to care and treatment for millions of rare disease patients. Leading up to the annual World Rare Disease Day on February 28, 2010, the Global Genes Project will help facilitate a series of denim focused awareness events, charitable activities and engage corporate sponsors, government officials, celebrities and the media to help spread its lifesaving message of hope. The Global Genes Project is asking rare disease advocates and supporters across the world to wear denim jeans and blue jeans denim ribbons the week of February 22 and leading up to World Rare Disease Day 2010. The organization is also asking supporters to display the blue jeans denim ribbon symbol on their websites and to actively invite co-workers, friends and family and their community to join in spreading this global message. Blue jeans denim ribbons can be obtained by visiting www.globalgenesproject.org. Denim jeans and ribbon wearing supporters can submit digital photos on Facebook: http://www.facebook.com/group.php?gid=214263320931&ref=mf. To join the growing list of supporters, visit http://www.globalgenesproject.org/sponsors.php. Global Genes Project Twibbons can be found here. A big thank you to Eunice Kennedy Shriver for leaving millions of people and families dealing with disabilities of all types a lasting legacy. Maybe President Obama will make a nice comment about Mrs. Shriver today and all she did for the Special Olympics considering his horrible Jay Leno joke a few months back. President Obama’s Special Olympics joke on Jay Leno may not seem like a big deal to some Americans but for others the gaffe is disappointing. 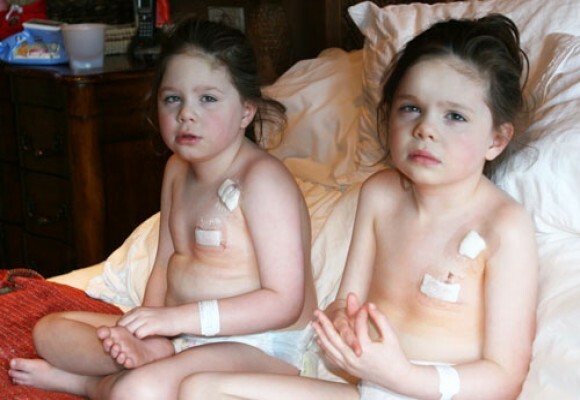 Our twins, Addi and Cassi, are afflicted with a rare and fatal cholesterol disease called Niemann Pick Type C and they are considered “special needs.” We have all made mistakes with words or put our foot in our mouth from time to time. President Obama is human too and must be forgiven by the special needs community for his off hand joke. Of all people, our President understands what it’s like to live in a society where stereotypes abound and hopefully he will turn this negative situation into a positive. What’s frustrating to me is that all special needs children seem to get lumped into one category — “retarded” (a word that should be forever removed from our vocabulary). Children with Ataxia-Telangiectasia are born healthy but completely lose their entire motor coordination control center in the cerebellum. Their minds remain intact but they progress to wheelchairs and often die in their teens. Someone on the street would think a child with A-T is intellectually challenged when they are not. Many children who fit into the special needs category have life threatening and debilitating diseases like Addi and Cassi – they are called Rare Diseases. Millions of people, primarily children, are afflicted with Rare Diseases that are often genetic in origin. President Obama needs to educate himself quickly and learn what it truly means to be special in America. He will then learn to laugh with us and not at us. More importantly, President Obama can not only help us overcome stereotypes but he can invest in much needed medical research that can keep our special kids alive.